California Guv Debate A Clash In Bios, Styles : It's All Politics California governor candidates Republican Meg Whitman and Democrat Jerry Brown showed their different styles and clashed on their backgrounds in their first face to face debate. California gubernatorial candidates Republican Meg Whitman and state Attorney General Jerry Brown engaged in their first debate Tuesday evening, a meeting that probably only reinforced for voters who've been paying attention who the two are. Whitman, a billionaire and once eBay's CEO with a lengthy resume of corporate achievement, stressed her management experience as she's done through her campaign fueled by a record amount of personal spending. Brown, a former governor and Oakland mayor, emphasized his decades of experience running government. Each tried to turn his or her opponents' supposed strength into a weakness, a standard technique of political jiujitsu. INA: The California budget is three months overdue, unemployment is above 12 percent and most voters think the state's on the wrong track. Former Ebay chief Meg Whitman says what California needs to solve its problems is some business smarts. You want to create jobs? Then improve the business climate. INA: Whitman proposes cutting a number of taxes, including capital gains. Jerry Brown said that would punch a huge hole in the budget and called the idea a giveaway for rich people, like Whitman. BROWN: I have a very specific plan. It's not to give a $5 billion tax break to myself and billionaires and millionaires. INA: Meg Whitman's fortune, estimated at more than a billion dollars has become one of the biggest stories of this race. She's spent $119 million of her own money, a record for a U.S. political campaign. But she insisted she's not trying to buy the election. As Ina reports, Brown boasted that as governor he was responsible for a budget surplus by vetoing spending legislation sent to his desk. Meanwhile, Whitman tried to tie Brown to public-employees unions that she suggested were partly responsible for bleeding the state. That allowed her to get off what was intended to be the evening's most memorable piece of trash talk. WHITMAN: Putting Jerry Brown in charge of negotiating with labor unions around pensions, around how many people we have in state government, is like putting Count Dracula in charge of a blood bank. Anyway, Whitman's more buttoned-down corporate style contrasted with the Brown's loosey-goosiness. INA: As combative as the debate was, Whitman remained poised, cheerful and always hit her talking points whether asked about them or not. Brown was looser, with self-deprecating wit. Like his response when asked if he could assure Californians that if elected, he'd focus on being governor and not run for president as he did twice when he was govenor before. The 72-year old Brown's answer? Naaah, he's too old now. BROWN: One more thing. I have a wife. I come home at night. I don't try to close down the bars of Sacramento like I did when I was governor of California. So don't worry about that. 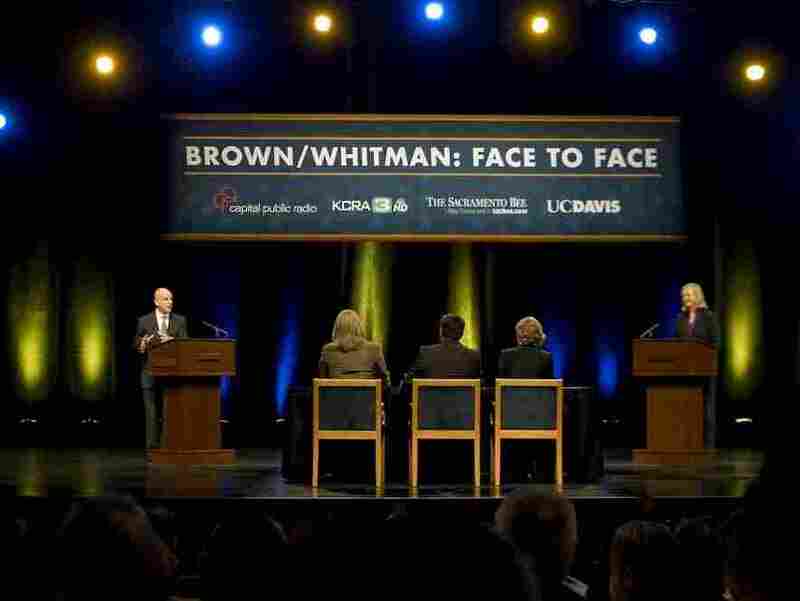 After the debate, the two candidates further demonstrated their different styles, according to the Los Angeles Times' PolitiCal blog with Whitman again showing a disciplined approach and Brown, not so much.